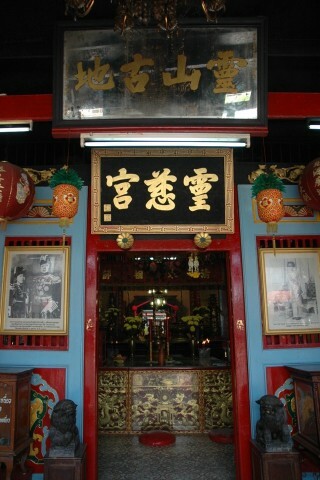 This shrine and Chinese temple is interesting to look at and the story behind it is even more so. In the mid 16th Century a Chinese nobleman called To Khieng whilst on a visit to Pattani fell in love with a local girl and married her. He converted to Islam, and being wealthy decided to prove his new faith by constructing a mosque (Krue Se Mosque) in his new found home. However, his sister Kor Niaw arrived from China to persuade him that his proper place was back home and that he should return with her forthwith. To Khieng refused and continued working on his edifice whereupon Kor Niaw cursed the mosque vowing it would never be completed. To Khieng began experiencing certain difficulties in that every time someone worked on the mosque they were struck by lightning. When this still failed to dampen his enthusiasm, his sister got fed up and hanged herself from a nearby tree. This action finally brought To Khieng to his senses and he stopped working on the mosque as he was overcome with grief. Ever since, all attempts to complete the mosque have failed. The cashew tree from which she hung herself was enshrined and Kor Niaw has since achieved Goddess status. A festival is held to honour her in February/March every year with processions and the site is now one of the most sacred Buddhist/Chinese sites in Thailand. Visitors of Chinese origin flock here in droves - note the tour bus carpark on the other side of the road.